Fortuity provides an intriguing thematic segue. 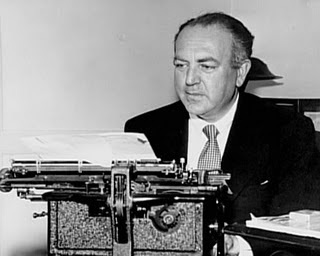 Brushing up on my Val Lewton research in anticipation of PFA's Complicated Shadows series, I came across a brief mention at The Val Lewton Screenplay Collection—a fantastic resource for Lewton fans—that, allegedly, Val Lewton drafted a 400-page treatment of Nikolai Gogol's historical novel Taras Bulba. I have no idea if this has anything to do with the 1962 film Taras Bulba—whose screenplay adaptation is attributed to Waldo Salt and Karl Tunberg—but, nonetheless, this bit of trivia caught my attention because no less than a week or so ago Federico Windhausen—who I met at Susan Oxtoby's reception for Robert Beavers—contacted me to let me know that he had recently completed a documentary on the making of the 1962 film, Taras Bulba, which he advised had been filmed in—of all places—Salta, Argentina. 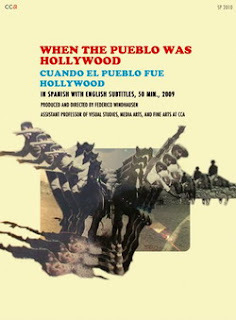 Director's Notes: "When the Pueblo Was Hollywood, directed by Federico Windhausen (Assistant Professor of Media Arts, Visual Studies, and Fine Arts at California College of the Arts) and shot by Rubén Guzmán (filmmaker; cameraman on Cowards Bend the Knee and The Saddest Music in the World), discloses a kind of waking dream experienced collectively by the residents of Salta, an Argentine province located at the foothills of the Andes (known to me through the films of Lucrecia Martel). In 1961, this remote section of northwestern Argentina served as the primary location for a large-scale Hollywood adaptation of Nikolai Gogol's novel Taras Bulba, which brought to provincial Argentina such actors as Tony Curtis and Yul Brynner. The production hired thousands of locals as extras, dressing them as 16th-century Cossacks and Turks, and it contracted dozens of gauchos to carry out dangerous falls on horseback during battle scenes. Chronicling a unique—and often contentious—cultural encounter, the documentary serves as both a portrait of a fading generation of Salteños and a reflection on the ways in which we live through the cinema." 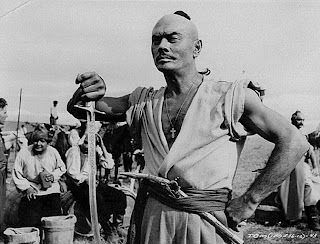 As a document of heartfelt curiosity, and admittedly an idiosyncratic (though welcome) historical footnote in cinema history, When the Pueblo Was Hollywood utilizes cinéma vérité cinematography to capture the remembrances of male and female Salteños regarding the filming of Taras Bulba in Salta and the transformative effect it had on their way of life. As one woman recounted, Salta at that time was a "small town, big Hell" which became, first, inflated by the Hollywood presence, and then conflicted and resistant to its commercial demands, resulting in strikes and repercussions. Wobbly camera work is more than compensated by fascinating testimonials recounting how Salta was temporarily transformed by Hollywood into a microcosm of fantasy, dream and ambition. Of notable interest is how the different classes of Salteño society claimed the experience for their own ends, ranging from naïve fantasy to eventual understandings of cinema's capacity for deceit. Listening to the gauchos explain how they performed their horse stunts during the film's epic battle sequences is thoroughly fascinating. One only wishes that Guzmán had made more use of a tripod and that vintage photos of the era had been edited with voiceover rather than simply held up to the camera lens. Notwithstanding, as a document of the disruptive power of studio filmmaking in a relatively rural setting, Windhausen's film effectively captivates and he is to be commended for capturing these stories before the participants have passed on. There's a resonant sweetness in elegantly-framed photos of Tony Curtis hung in the barbershop whose barber cut Curtis's hair each day on the set. Kurt Anderson has conducted an on-air preview of the documentary for Studio 360 and San Franciscans have the opportunity to catch a free preview screening of the film on Friday, February 5, 7:00PM in the Timken Auditorium, California College of the Arts, at 1111 Eighth Street (between Hooper & Irwin), San Francisco. Directions can be found here. 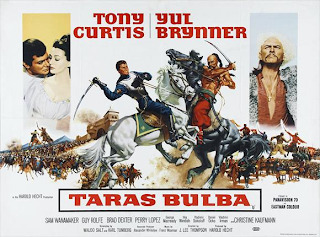 02/02/10 UPDATE: A little more research reveals that Val Lewton worked on David O. Selznick's 1934 proposed adaptation of Taras Bulba. According to Nick Zegarac at The Hollywood Art: "Lewton's mother, Nina—a Selznick employee in the story department was advised to assemble a writing team of Russian talent to aid in the research and development of this property. Unbeknownst to Selznick, Nina slipped in the name of her own son. Lewton was promptly hired. 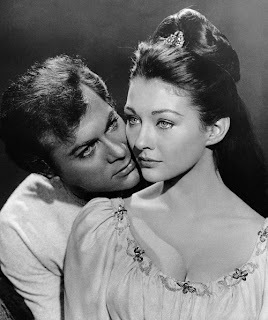 Though Selznick's plans for Taras Bulba eventually fell by the waste side, Lewton quickly acquired a toe hold in the writer's department, eventually rising through the ranks to become Selznick's story editor."